Congressional Democrats are largely uninterested in the subject of impeaching President Donald Trump as they seek to win back the House in 2018, wary of such a partisan fight that might rouse Republican voters. That's to the chagrin of media members who have recently declared Trump guilty of obstruction of justice. David Leonhardt penned an opinion piece in the New York Times Sunday entitled, "An Article of Impeachment Against Donald J. Trump," writing, "Is serious consideration of impeachment fair? I think the answer is yes. The evidence is now quite strong that Donald Trump committed obstruction of justice." CNN legal analyst and New Yorker writer Jeffrey Toobin wrote last week that the answer was "clear" on whether Trump had committed obstruction. "Even on the available evidence, Trump’s position looks perilous indeed," Toobin wrote. "The portrait is of a President using every resource at his disposal to shut down an investigation—of Trump himself." 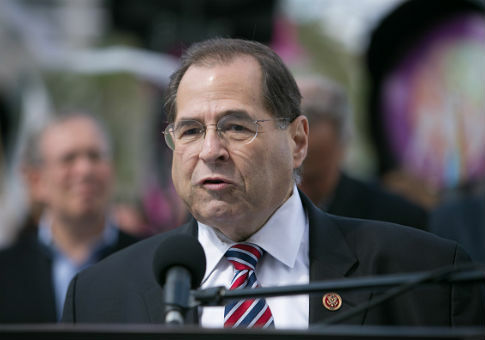 Rep. Jerrod Nadler (D., N.Y.) is the ranking Democrat on the House Judiciary Committee and would be poised to chair the committee if Democrats win the House of Representatives in the 2018 midterms. However, the Washington Post reports, Nadler has signaled he's not interested in pursuing impeachment if a conviction in the Senate—which requires a bipartisan, two-thirds vote—looks impossible. "An impeachment cannot be partisan," Nadler said at the Capitol earlier this month. "There isn’t a hell of a lot of a point to impeaching a president and having him acquitted in the Senate." Nadler was a fierce critic of the ultimately successful Republican effort to impeach President Bill Clinton in 1998, but he also found himself at odds with his own party toward the end of the George W. Bush administration, when Democrats wanted President Bush impeached for a wide variety of perceived offenses. While billionaire Democratic megadonor Tom Steyer has poured millions of dollars into a national impeachment campaign, his movement has not been met with enthusiasm by the party's higher-ups, including House Minority Leader Nancy Pelosi (D., Calif.) and House Minority Whip Steny Hoyer (D., Md.). Rep. Matt Cartwright (D., Pa.), who is running for re-election in a district Trump won by double digits, is also among the naysayers. "I think there are two levels," Cartwright said. "There’s the legal analysis and then there’s the political one. Under both analyses, impeachment is not appropriate." Rep. Ruben Gallego (D., Ariz.) said he was not ready for impeachment and wanted special counsel Robert Mueller to finish his investigation. "I’ve been getting some calls, asking why don’t I vote to impeach the president?" Gallego said. "Well, I’m not signing up to impeach the president, because I believe in the impartiality of the special prosecutor. If the report comes out and says something illegal happened, that’s when I’ll make a decision." Rep. Al Green (D., Texas) introduced articles of impeachment in December on the basis of Trump being a bigot who was unfit for the presidency. The motion to sideline the attempt was approved 364-58. This entry was posted in Politics and tagged Donald Trump, Jerrold Nadler, Robert Mueller, Russia, Washington Post. Bookmark the permalink.